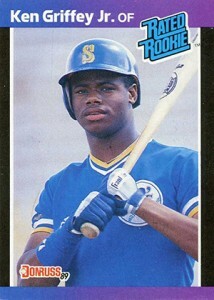 1989 Donruss Baseball is perhaps best remembered for the hunt for Ken Griffey Jr. rookie cards. And while they're all worth very little today, for the most part, the set is actually not bad -- especially when you compare it to the set that came before it and the one that followed. Once again, the set has 660 cards, making it big but not the biggest of the year. In fact, Topps and Upper Deck are both larger. 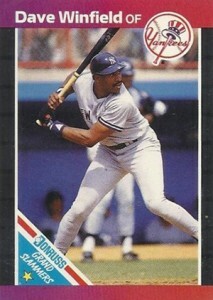 1989 Fleer is the same size. Donruss was never a brand about a lot of subsets, but there are a couple that lead the set off. Diamond Kings highlights one player from each team with a painted portrait. With Griffey, Randy Johnson and Gary Sheffield, from a player perspective, this is probably the strongest crop of Rated Rookies ever in a Donruss set. 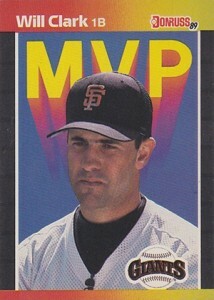 Other rookie cards include Curt Schilling and Dante Bichette. 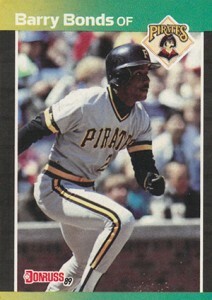 While the side borders are black, the overall look of the base set isn't nearly as dark as 1988 Donruss Baseball. That said, it's far from the bright reds that would come the following year. 1989 Donruss Baseball has a couple of insert sets, although none are particularly hard to find or expensive. MVP cards return with one top player from each franchise. Grand Slammers has 12 cards of players who cleared the bases with a single swing. One is in every cello pack. 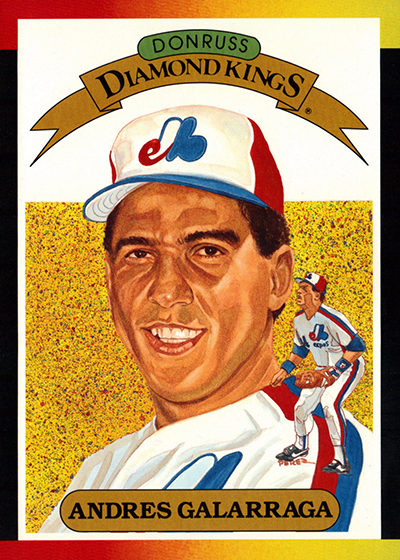 A set was also included in 1989 Donruss Baseball factory sets. 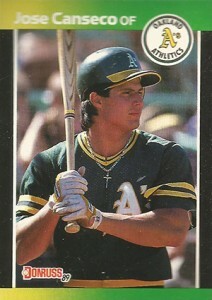 Blister packs have a Jose Canseco card that's similar to a box bottom insert. Diamond Kings Supers are over-sized versions of the regular subset cards available through a mail-in offer. 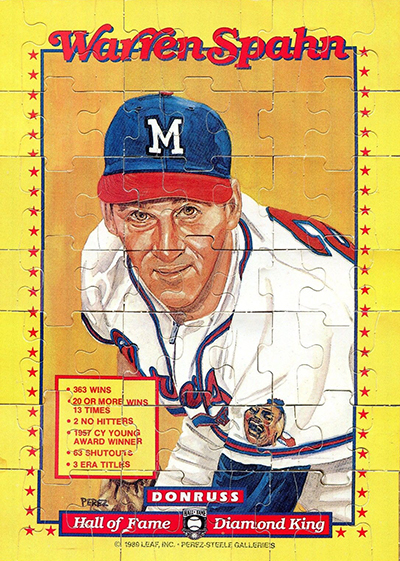 The annual puzzle subject is Warren Spahn. Each wax pack has a card with three pieces on it. Sixty-three pieces make the full painted portrait. 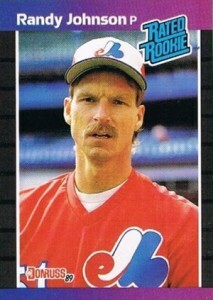 Don't expect to get much for any 1989 Donruss Baseball cards today. Printed in massive quantities, it has killed any potential real value. The borders make it relatively tough for top-end professionally graded cards. But with such a massive pool of cards to draw from, there's still no shortage. 21 cards. Each card has three puzzle pieces. 28 cards. Available through mail-away offer. Very colorful design which is an eye catcher. Loaded with rookies such as Griffey, Sheffield, Johnson, and Schilling. Diamond King subset kicks off the set. Unfortunately these are worth very little.